A Secchi disk reading of less than 2 meters (6.5 feet) is evidence of an algae bloom. 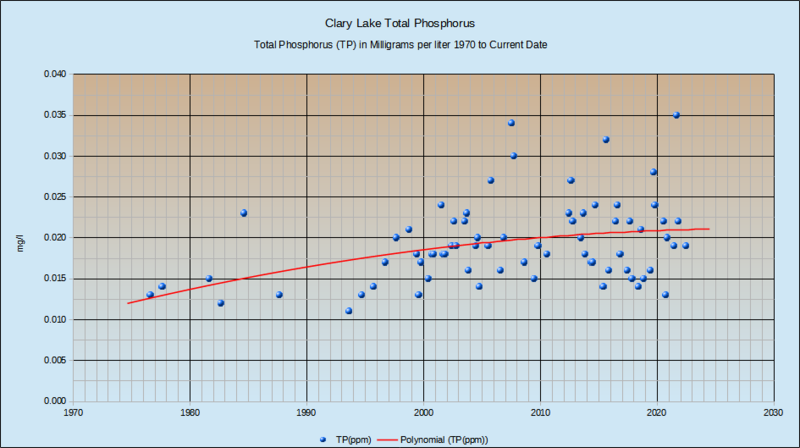 A total phosphorus of greater than 0.015 mg/l indicates a possibility for algae bloom. If you want to download this data here’s the spreadsheet. Notice the new table format: To sort the table by any column, click on the column heading. For example, to see the data sorted by date with the newest at the top, click on the Date heading twice. To see more data on the page, change the number of entries at the top left corner of the table. Enjoy. To sort in reverse order (newest data at the top) click on the first column heading labeled # (and you’ll have to click it twice, because). 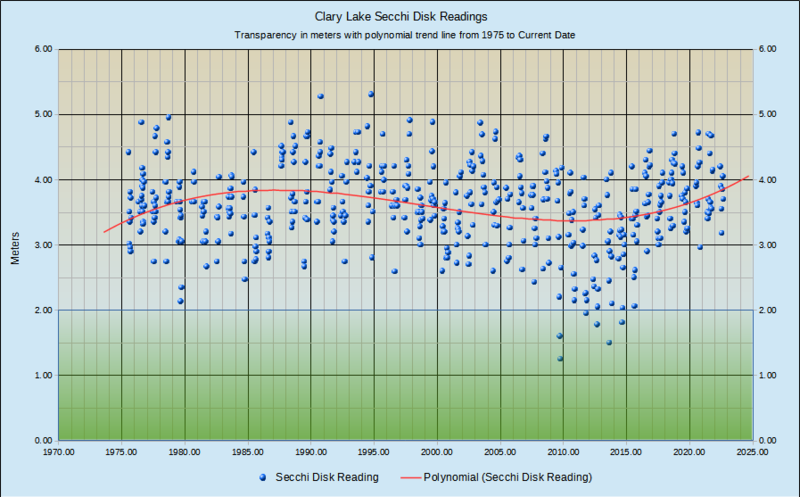 Check out the Near Real-Time Data site for secchi disk readings in Clary and other Maine lakes. 15 06/30/2013 3.05 10.01 70.7 8.6 0.7 Data sent to "SECCHI Dip-in for 2013"
39 07/10/2015 2.50 8.20 76.3 9.6 0.7 Very Murky. 77 07/07/2018 4.10 13.45 78.1 8.1 0.5 Clear! 78 07/20/2018 4.30 14.10 25.0 8.4 0.4 0.021 Clear! 79 08/05/2018 3.94 12.92 29.0 7.8 0.5 Clear! 81 08/31/2018 4.24 13.94 25.7 8.3 0.6 Very Clear! 82 09/14/2018 4.70 15.42 24.0 8.8 5.1 Very Clear! 83 10/01/2018 4.40 14.43 18.30 9.5 9.4 Clear! 84 10/12/2018 4.24 13.91 15.7 9.8 9.6 0.015 Clear! The above data represents a subset of water quality data collected by Clary Lake volunteer water quality monitors in conjunction with the Maine VLMP. This page will be updated periodically as more data becomes available. Our water quality monitors typically gather data every 2 weeks from early spring until late fall. As time permits we’ll make older archived data available.